The beautifully kept garden in the cloisters adjoining Ewelme Church packs a punch. If you haven't visited the historic church at Ewelme you are missing a treat. 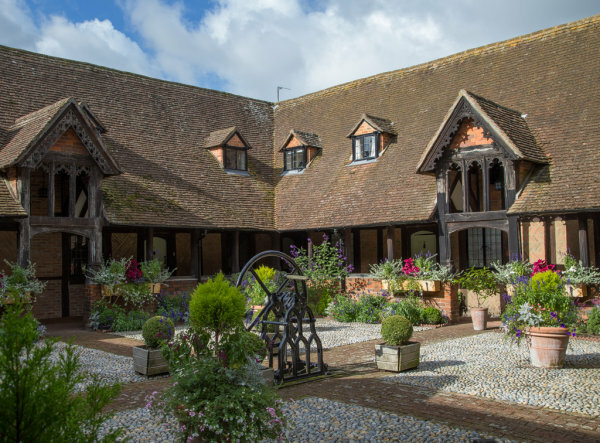 With a beautiful stonework chequerboard facade and links right back to Chaucer there is much to see inside and out. Don't miss the cloisters adjoining the church at the back. This courtyard garden surrounded by Almshouses is tended by a group of gardeners who do gardens for Chelsea - and it shows. On the day I visited the window planters and pots were overflowing with lavender, purple salvia and contrasting blue/grey and flaming pink foliage - a real treat in October!